The portrayal of depth in paintings and later in photography has been a long quest for artists. It was not until the early 15th century during the Renaissance period that the techniques for showing perspective were first demonstrated by the Italian architect Bruneselleschi. Leonardo da Vinci in his "Trattato della Pittura", refers to a "perspective frame" as his method of studying diminishing perspective. The artist would look through the eyepiece and see an image of the subject on the paper clipped to the glass plate. The artist would then draw around the visible outline on the paper to produce a drawing with perspective. Leonardo also developed another system called aerial perspective whereby the misty atmosphere blurs and changes the colours of the landscape as it dissolves into the distance. Perspective in drawing and painting remained the only way of providing the illusion of depth on a 2-D canvas until 1838 when Sir George Wheatstone gave a lecture on binocular vision. Wheatstone made a device called a "Reflecting Mirror Stereoscope" with which to view his 3-D drawings (the original device has been preserved in the Science Museum). However, it took a further twelve years before Scotsman Sir David Brewster invented the first practical photographic device called a "Lenticular Stereoscope". Brewster presented Queen Victoria with a stereoscope in 1851 at the Great Exhibition in the Crystal Palace which helped to popularise the medium. Many photographic companies developed to market stereo photocards (stereograms) and stereoscopes. Photographers were sent across the world to record famous sights and events in stereo in order to quench Victorian societys thirst for knowledge. "See the world from your parlour! ", is just one of the many advertising slogans from the time which seems to sum up the power of the new media. It has to be remembered that most peoples view of the world at that time came from paintings, wood prints and drawings and so the excitement of seeing real images in three dimensions must have been tremendous. The medium was so popular that most photographs taken in the Victorian period were stereograms although we now tend to see them as single images. 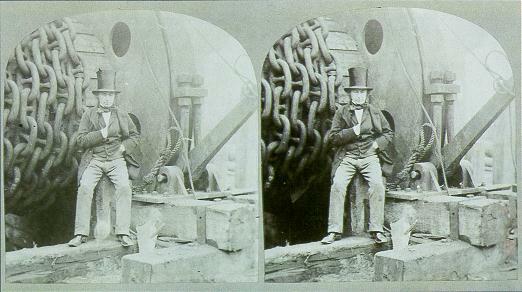 A good example of this is the famous photograph of Isambard Kingdom Brunel in front of the launching chain of the steamship "The Great Eastern" by Robert Howlett which we typically see as a single shot but which was intended to be viewed as a stereogram. The stereoscopes themselves became very complicated and designs varied tremendously from the single card viewer to a machine that could store and view fifty or more stereograms. Stereograms and stereo photography started to lose public popularity during the early part of the twentieth century as cameras and photography became simpler and cheaper. George Eastman began the trend for consumer photography with his KODAK cameras in the early 1900s and the development of 35mm cameras in the 1920s marked the beginning of the end for the stereo technique. 3-D photography proved to be to complicated and expensive for the average `snapper and required a special viewing device. 3-D pictures could not be enlarged, put in a frame, album or hung on a wall which further reduced their flexibility. A number of manufacturers did try and make the technique simpler by producing stereo cameras like the Kodak Stereo Realist but the ease and simplicity of single 2-D images meant that the technique remained the realm of the keen amateur and professional photographer. Having said all this, a number of attempts have been made to revive to revive the format and new technologies developed to simplify the viewing and taking of these pictures. During the twentieth century, stereo photography became more commercialised and a small number of companies emerged who specialised in producing stereo images and viewers. The most well known of these is "View-Master", an American company founded in the late 1930s. The View-Master systems uses 7 pairs of photographs (slides) mounted around the circumference of a 90mm disk. The viewer itself was a simple affair which used natural light to provide the illumination (see figure 4). The quality of the system was so good however that the US military commissioned "View-Master" to produce disks for training personnel on ship and aircraft recognition as well as range estimation. In 1951, View-Master bought their main competitor "Tru-Vue" and with them the rights to use Disney characters. This widened their product range considerably, as they were able to supply disks aimed at the childrens market as well as the adults. The current owners "The Fisher Price Division of Mattel Inc" still actively market "View-Master" devices and disks and have just developed a new viewer in conjunction with the "Discovery Channel" which can be used as a pair of binoculars or a stereo viewer. Kodak have also produce a number of stereo cameras, the last of which, was introduced in the 1950s and called a Stereo Realist. This camera could take two pictures simultaneously on 35mm film. A number of other manufactures made similar cameras with negatives of the same size and format but these failed to gain popularity. In the late 70s, two Americans, Jerry Nims and Allan Lo, developed a new stereo system based on a new print technology. The camera they developed called the NIMSLO takes four images per picture. A special developing process combines these images into one so that the resulting picture can be viewed without the aid of any special equipment. The camera uses standard 35mm film and produces 18 pictures from a 36-exposure film. Despite very aggressive marketing, the system failed to achieve its full potential in the photographic market place. However, cameras from a number of manufacturers including single use devices are still readily available although processing can only be done in America at present. Dennis Gabor invented the ultimate stereoscopic photograph, the hologram, in 1947 but it was not until Leith and Upatnieks discovered a simplified process in 1961 that holograms were manufactured commercially. Holograms give true three-dimensional representations which allow the viewer to see the subject correctly from different angles. Holograms are virtually impossible to copy and are therefore used as security devices on credit cards, software and designer labels. To understand how the stereo technique works, an understanding of human vision is required. The human eye is essentially a fully automatic digital camera with a variable focus lens, variable aperture and a surface for converting the light pattern into electrical signals for the brain to interpret. The image from an eye is essentially a 2-D picture i.e. we can see width and height but no indication of depth. With 2-D images we can determine the order of objects receding into the background from visual clues like size and overlap but have no sense of how far apart they are. Humans are blessed with having two eyes however, both forward facing but horizontally spaced by approximately 60mm. When looking at an object, each eye will produce a slightly different image, as it will be looking at a slightly different angle. The human brain combines both these images into one to give a perception of depth. This processing is so quick and seamless that the perception is that we are looking through one big eye rather than two. The brain can also determine depth and how far objects are away from each other by the amount of difference between the two images that it receives. The further the subject is from the eye, the less will be the difference between the two images and conversely the nearer the subject, the greater the difference. Figure 7 gives a graphical example of how this works. The left and right eyes see the sun in the same place as it is in the distance. The tree being much closer is seen in slightly different places. The whole process is called stereo vision and it is derived from the Greek word `stereos which means form or solid i.e. having three dimensions. Stereoscopy is therefore the science by which two photographs of the same object taken at slightly different angles are viewed together, giving an impression of depth and solidity as in ordinary human vision. It follows that stereo photography is the art of taking two pictures of the same subject from two slightly different viewpoints and displaying them in such a way that each eye sees only one of the images. The distance between the two viewpoints is called the stereo separation and this should be the same as the average persons eyes i.e. 63mm. Accuracy is not important, however as the brain is able to compensate but too large a separation will produce an unresolvable image. When taking stereo photographs, the camera should ideally be pointing at the subject and the background should be kept in the same place in both images (see figure 7). The simplest way to ensure correct horizontal and vertical alignment is to note the position of a distinctive feature in the background of the first shot and ensure that it is in the same position in the second. The ideal stereo separation should produce a ¼" difference in position of the subject between the two images. In order to achieve this, the separation of the cameras must alter in proportion with the distance of the subject from the camera i.e. the nearer the subject, the smaller the separation and vice versa. Human eyes are of course fixed and this explains why we lose stereo vision of objects as they recede into the distance. As the subject gets closer, human eyes lose the ability to focus long before the relatively large stereo separation makes the image unresolvable. In order to see a 3-D effect when shooting landscapes, therefore, the stereo separation has to be large and typically measured in feet while close up and macro photographs require a separation of a fraction of an inch. There are no hard and fast rules when operating at these extremes and it is advisable to experiment to find the separation that best suits the subject and the camera equipment being used. None of the authors who provide practical guidance on stereo photography agree on a general principle for example John Hedgecoe recommends a separation of 1/50th of the distance between the camera and the subject for distant objects and a ¼ of the subject distance for close-ups while others suggest 1/30th of the subject distance should be used. Dennis Brown, however, uses a different technique based on the principle that to get the best stereo separation, the foreground or subject should be shifted by approximately ¼" (6mm) and the background to remain in the same position. He calculated the amount of shift required for different subject distances and camera focal lengths and produced the following table. The distances in the table are modified by two further rules that increase the separation by a factor of 2 if the subject is halfway to the background and 4 if it is near the background. The principles behind stereo photography are simple enough however the practicalities are a little more complex. The technique can be split into two specific areas, namely the capturing and the presenting of the image. Capturing the image on film requires the photographer to take two pictures from slightly different viewpoints. The traditional method for doing this is to use a camera with two or more lenses, shutters, iris and film planes, which takes two pictures at the same time. These cameras were specially made and traditionally quite large and expensive. "Miniaturisation" came in the 1950s with the Stereo Realist (see figure 3) and its use of 35mm film rather than roll film and a number of other manufacturers developed compatible systems. Some cameras, typically 35mm with standard 50mm lens, can be fitted with a beam splitting device which produces two images on a single frame. This device basically uses mirrors to bring the two images side by side so they fit into one standard 35mm frame. Other single camera solutions include the Nimslo camera as discussed earlier which records four images per shot on 35mm film and a technique called Xography on large format cameras. Both these techniques are used to produce lenticular prints which will be discussed later. The advantage of the single camera system is that it is simple to use and can take pictures which include moving objects as all the images are recorded at the same instant. The stereo separation is, however, fixed (distance between the lenses) and there are a limited number of lens focal length options available. An alternative method is to use two identical cameras, which are fixed on to a bar at the correct separation distance. The bar would typically be designed to have a sliding mount for at least one of the cameras so that the stereo separation can be altered simply and quickly. The same lens, aperture, shutter speed and focus distance must be set on each camera before the shutters are released simultaneously. While this is a potentially expensive solution, it is probably the most versatile as it allows the photographer full control over the film format, exposure, lens system and stereo separation. A very simple and cheap version of the twin camera set-up can be made from two disposable cameras secured by tape on to an "L" shaped aluminium extrusion. Disposable cameras have a fixed focus, aperture and shutter speed and so the exposure should be identical. Use the viewfinder of one of the cameras to line up the shot and then press both shutter buttons simultaneously. The mounting bar used for the twin camera set up can also be used with just one camera by moving the camera from one position to the other. Using a bar with a slide makes this simpler, gives accurate stereo separation and ensures that the camera is kept at the same height and distance from the subject. This method is very simple and requires a minimum of outlay. However, all stereo photography using a single camera cannot be used where the subject is moving as the time delay between shots will mean that the subject will be in a totally different position or not even in the frame when taking the second image. The simplest but least accurate method is just to move the camera by hand. If the camera is hand held then by shifting body weight from left to right foot or vice versa will provide a relatively accurate stereo separation equivalent to the distance between the eyes (60mm). Alternatively, the camera can be mounted on a tripod and the whole assembly moved. Great care must be taken however when using these methods to ensure that the height is kept the same and that the camera is pointing at the subject (a point in the background of the picture should be used as a reference and it should remain in the same position in each shot). The creation of holograms requires lasers which are still very specialised pieces of equipment and therefore not easily available to most amateurs or professional photographers. 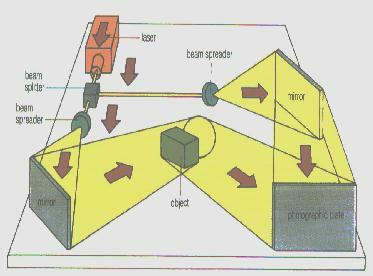 The laser produces a very pure and concentrated light source, which is first split by being shone at a partially silvered mirror and then widened using spatial filters. One of the beams called the reference is shone directly at the film while the other is reflected onto the film from the subject. The two light sources create an interference pattern or fringes on the surface of the film which look like a series of craters or smudges when looked at closely with normal light. 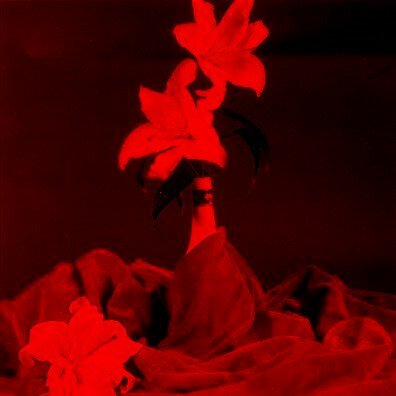 Due to the lighting and equipment requirements, this technique is generally suited to still life although a number of photographers have used it for portraiture e.g. the William Shakespeare hologram used on credit cards. In order to view the captured photographs, the images have to be displayed in such a way that each of the viewers eyes sees only one image. There are a number of techniques used to achieve this and a number of examples of the main techniques have been provided as an illustration in the Stereo Photography Gallery in Appendix B. There are a number of modern versions of the stereoscope available today for viewing pictures. The "View Magic" is a viewer designed in America which requires the two images to be mounted vertically rather than horizontally. The viewer uses mirrors to align the images correctly so that they appear to be horizontally mounted. Mounting the images in this way removes one of the limitations on stereo photography i.e. the size of the print. Human vision is designed to have a wide angle of view horizontally i.e. letterbox format but traditional stereoscopic photographs tend to be square. The reason for this is that the traditional horizontal mounting of the images means the centre of both images must be approximately 60mm apart i.e. the same as the distance between the eyes. The images can therefore only be 60mm wide and although height is not restricted in theory, most viewers used a fixed mount for the composite image i.e. the viewer could not be moved relative to the image being viewed which restricts the viewing height. These restrictions do not apply to the "View Magic" device as it is a hand held viewer and can therefore be used with any width prints. The only imitation is the height which can be a maximum of 4" as the mirrors are set for this print height and cannot be adjusted. Free Viewing is another technique for viewing horizontally mounted images without the aid of a physical viewer device. When Free Viewing, the eyes should not converge but look parallel as if the image being looked at is in the distance. The brain is fooled into thinking that it has two separate images and creates a 3-D visualisation. The viewer will often be able to see three pictures at this point i.e. the left image, the 3-D image and the right image. A recent development of the Free Viewing technique is the "Magic Eye" picture or the "Single Image Random Dots Stereogram (SIRDS)" and the "Single Image Stereogram (SIS)". These pictures are created by computer and generally comprise of a simple picture e.g. a fish hidden within a pattern of colours. The pattern can either consist of seemingly random dots or a repeating vertical pattern. "Magic Eye" pictures rely on the fact that the brain depends on matching vertical edges to synchronise the left and right images. The picture is made up of columns of patterns, which vary slightly across the picture. The brain interprets the columns as left and right pairs and the slight differences between each column define the subject e.g. the fish. 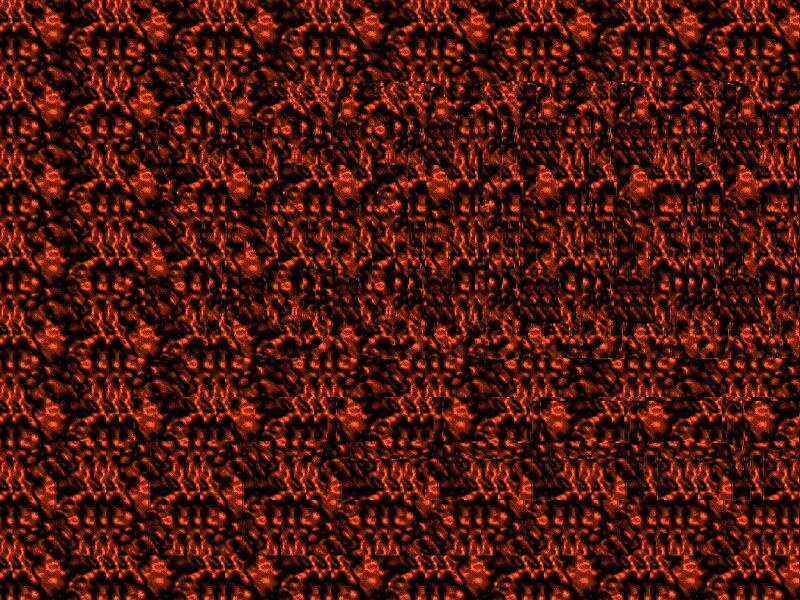 "Magic Eye" pictures also use a number of different Free Viewing techniques which I have listed in Appendix A. Like the "Magic Eye" pictures, the remaining techniques for displaying 3D-Images will all use a single image, which contains all the information, required to reconstruct the full picture. The most common of these is the Anaglyph which requires the viewer to wear glasses with red and green/cyan lenses. The left image has the blue and green colour channels removed to leave a purely red picture while the right image has the red channel removed. 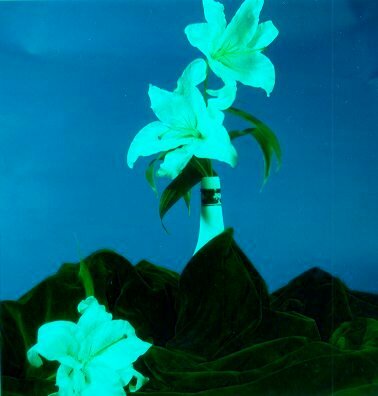 The two images are superimposed into one picture which produces a picture very like the original with a red and cyan fringes around objects where the stereo separation produces differences in the original images. The red and cyan lenses in the glasses let the eyes separate the two superimposed images into their individual components which the brain then combines to form a 3D-image. High contrast areas  which will appear as ghosts or shadows in the final image and can be very uncomfortable for the viewer. Large red zones  No stereo effect will be seen with areas of red as they will only appear in one of the images. If using a computer, the red channel of the right image can be edited and some blue or green added to the problem areas, which will change the final colour but give a stereo effect. Large Stereo separations create large colour fringes which bias the overall colour of the picture. The image displacement should be ¼" or less to avoid this effect. 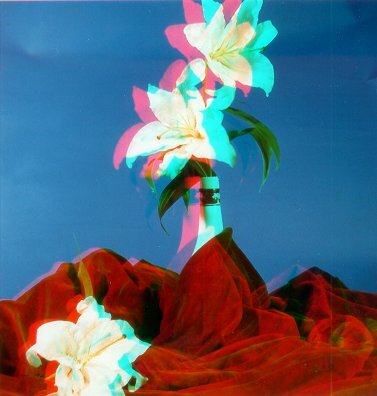 All the anaglyph images in Appendix B were created using scanned images on a PC and as can be seen by the examples, the process works on either black and white or colour images. The anaglyph process is very simple and the viewer i.e. the glasses, are very cheap to make. It is not surprising therefore that anaglyphs have been used for a wide variety of applications including 3D comics, page three girls, novelty items and movies. Lenticular prints are an ingenious way of producing multiple or 3D images in one picture without requiring a special viewing device. The final picture comprises of a number of images that are printed as very fine interlaced stripes. A special screen is laid over the top of the picture allowing the viewer to see only the stripes which correspond to one particular image at a time. The screen is called a lenticular screen and it comprises of a series of very fine lenses running in the same direction as the stripes. As the viewing angle changes, a different image will be visible. If the stripes are horizontal, then the final picture will contain a series of images that can be seen by tilting the picture. Vertical stripes are used for 3D pictures however as each eye will have a different viewing angle and therefore be able to see a different image. Horizontal lenticular prints are often used to show motion sequences e.g. a horse running and are commonly used in promotional novelties like the football card in Appendix B. If a horizontal lenticular picture is turned through 90 degrees, a confused and blurred image results as the two images seen by the eyes do not match and cannot be resolved to make a 3D image. A 3D Lenticular picture turned through 90 degrees allows the viewers to see the individual images used to create effect. Xography, as mentioned earlier, is a technique used with large format view cameras to produce stereo pictures. The camera is fitted with a special elongated cylindrical lens and a horizontal shutter, which travels from, left to right. A lenticular screen in front of the filmplane ensures that the image is recorded as a series of thin strips that represent the view from each eye. When the negative is printed, a matching lenticular screen is placed over the resulting picture so that the image can be viewed correctly. A simpler way to make lenticular prints is to use a NIMSLO or similar camera which takes three or more images per picture. Processing for these cameras is only available in America, however, there are a number of agents in the UK like the "Widescreen Centre" who will handle the film. Ultimately, the best 3D picture comes from the hologram as it projects a complete representation of the original subject in space. The original holograms required a laser to be shone through the holograms surface in the reverse direction to that of the original reference beam. The requirement of a laser and its accurate positioning relative to the holograms surface limited its usefulness however a new process of embossing has been developed which gives a limited viewing angle but uses natural light for viewing. The technique basically involves making a hologram of the image projected by the original hologram. The laser light used to make the hologram is filtered so that the wavefronts of light are polarised in one direction and the photographic plate has a special coating that forms an ultra thin relief when developed which can be used as a die for embossing. Once the master die has been created, copies of the hologram can be made quickly and cheaply. The resulting holograms can be seen in normal daylight however the subject will be seen from a fixed vertical viewpoint while allowing a horizontal look around. This type of hologram is often referred to as a rainbow hologram as a rainbow effect is seen when the viewers eyes move vertically. The most important aspect of stereo photography is the human brain and its ability to fuse the two images into a three dimensional reality. Through my research and experiments with stereo photography, I have discovered that a number of people, including myself, do not see in 3D normally although most people can see stereo photographs correctly. If no 3D effect can be seen when looking at the pictures in appendix B then the following research statistics may be of some comfort! "Richards (1970; Experimental Brain Research 10, 380-388) did a survey among 150 MIT students and noticed that "...about 4% of the students are unable to use the cue offered by disparity, and another 10% have great difficulty and incorrectly report the depth of a Julesz figure relative to background." He further concludes that inability to use stereopsis is an inherited defect and is related to "three-pool"-hypothesis of binocular neurons." There are many uses for stereo images apart from the obvious artistic applications. I have already mentioned some in my essay for example holograms used for copyright protection and there are many more areas where a 3 dimensional view gives significant advantages. Reconnaissance and cartography are two such areas where these techniques are used to assess the lie and features of the landscape. Trained military observers can spot subtle changes in the landscape, tyre marks and a variety of other signs that would indicate an enemys presence and position. Engineers use holograms to detect minute changes in components when they are subjected to stress. A hologram of the component for example an aircraft tyres is made before and after ti is subjected to some mechanical stress. The differences can be detected by superimposing one hologram on another. The theory behind stereo photography is simple, the creation and delivery of the images can be complex. The basic technique has a long history and its popularity has waxed and waned despite numerous attempts to popularise it. There are a number of societies around the world for this media, the oldest of which was founded in 1893 in the UK. Several publications are also in print although they tend to be published in America and not easily found in Britain. There are many websites and newsgroups on the Internet dedicated to this medium which display a variety of stereo images and information. The popularity of "Magic Eye" pictures and rainbow holograms in the mid 90s has proved that interest in stereo photography still exists and has helped to ensure the continued development of new technologies.